09.15.09 = I have always admired artists who can draw a perfect bird and can paint a wonderful landscape. I too see in pictures, but I’m not able to get my hands to do what my brain sees. Let’s face it, I can’t draw or paint worth a darn. I used some of the artistic filters in Photoshop to do something a little different today. I had fun playing around with the textures, brush size and stroke size on this one. Artist? PS: Do you see the little face at the top in the head of one of the purple flowers? Its beautiful...very nice work!! I do see the face! 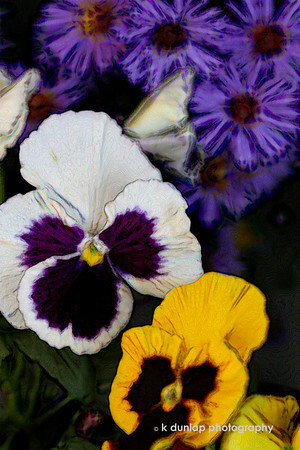 This is beautiful...is it pansy time again? You are definately an artist. This is beautiful. Nice work on the treatment! Beautiful. Love that lil face!